Life can change is a split second. I got to know about that yet another time just last week. My wife and I were on the way picking our daughter up from a school event in the evening. It was a dark fall night and we were on a two lane road with two cars in front of us not even 4 miles from home. This road goes through beautiful farmland in Southern Chester County. It can get lonely out here; there is usually not much traffic here. Then it happened. Boom! The small pick-up truck in front of us hit a pedestrian. His body got thrown around like a ragdoll with shoes flying one way and his iPod and headphones the other way. He came to rest just at the side of the road. We immediately stopped, got out of the car assessing the situation. 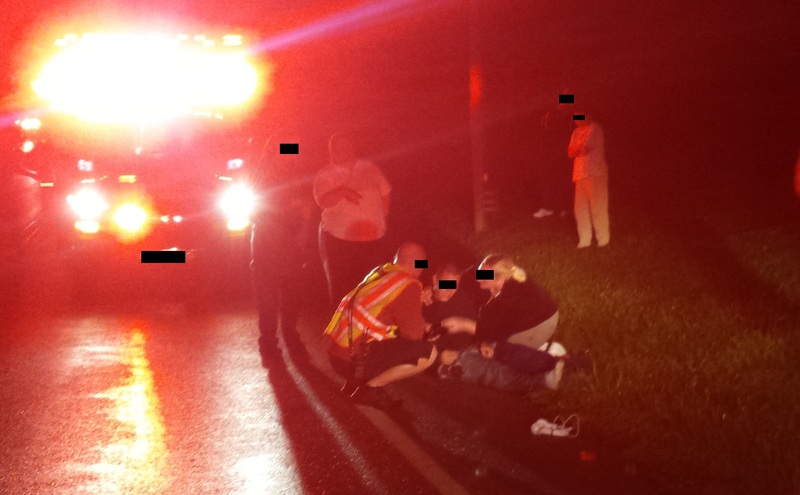 My wife being a trained EMT took vital signs while I called 911 together with a few other witnesses. This young kid was unconscious and I actually thought that he was deceased. I felt so bad for the man who hit him with his truck. He also had immediately stopped and was helping me slowing traffic down and directing cars around the accident scene. He was so grief stricken because he also thought the young man had passed away. All of a sudden the victim came to. The more alert he got the more agitated he grew. He should have been in severe pain. His head was bleeding, he had severe bruises on his back and side, and his pants were torn and his legs were not looking right. Yet, he wanted to get up and just let the expletives fly. He verbally assaulted my wife and anyone within arm’s reach. It did not matter who it was. Even the police officers, firemen, and EMT personnel did not escape his verbal abuse. What in the world was going on here? Then I smelled one reason and got to know the other right after that: he had had alcohol and meth through the course of the day. This guys was stoned out of his skull. The more everyone wanted to help the more he pushed it back. The louder people got the more the situation spiraled out of control. One woman arrived at the scene whose son was good friends with the victim. She neeled down and connected with him by telling him how much her son cared about him and how much it would mean for him to accept medical treatment. She hugged him and told him how much he meant to her son. Finally the young man relented and broke down in a sobbing mess. Only love – unconditional love – finally won in the end no matter how hopeless this situation had been just minutes prior. With emergency crews well in control of the situation we left the accident scene picking up our daughter. The whole scene has kept haunting me since. There are a few thoughts that go around my head based on what happened that night. This young man is unfortunately not the only young person with drug problems here in the area. Heroin is so cheap and small villages and towns do not have enough or any police patrols. That is why the drug issue is rampantly out of control. What is causing so many young people turning to drugs? Based on what the young man blurted out on scene led me to believe that he had no one in his life loving him but his grandma. Only very few people were really close to him. I sensed total hopelessness. Are drugs the answer though? Love is missing from the lives of so many. My thoughts keep circling around the influence we parents have on our kids. Are we really deeply enough involved with our kids? Are we trying hard enough staying together as husband and wife making our families work? It seems that the more issues our families have and the more broken our homes are, the greater the chance of us encountering such messes on the dark streets one night. Are we doing everything we can to do something about this? While many daily news shows are often filled with stories of hit-and-runs this story shows that there are others the news never report on. My thoughts are with the man who hit the young victim. I commend him for stopping no matter what the consequences could have been. The evidence of compassion and empathy on the driver’s part and that of so many first responders (before even the medic had shown up) was heartwarming to experience. Love for others than themselves was self-evident that night. The fine red thread that runs through this story very strongly is love. Love is the only answer saving you, me, and our kids. What more can we do to foster it?